As well as revealing the Xbox One S All-Digital Edition yesterday, Microsoft also has another treat in store for gamers -- the Xbox Game Pass Ultimate. Just as there had been rumors about the Xbox One S All-Digital Edition ahead of the announcement, there had also been talk about this new combined subscription. Due to launch at an undisclosed time later this year after beta testing, Xbox Game Pass Ultimate combines the existing Game Pass with Xbox Live Gold, all for $14.99 per month. The new deal will save anyone who was subscribing to both services $5 per month, and the package will be tested on Xbox Insiders. When it launches later in the year, Xbox Game Pass Ultimate will be available in all current Xbox Game Pass markets. We're excited to announce Xbox Game Pass Ultimate. Xbox Game Pass Ultimate will include all of the benefits of Xbox Live Gold with Xbox Game Pass. 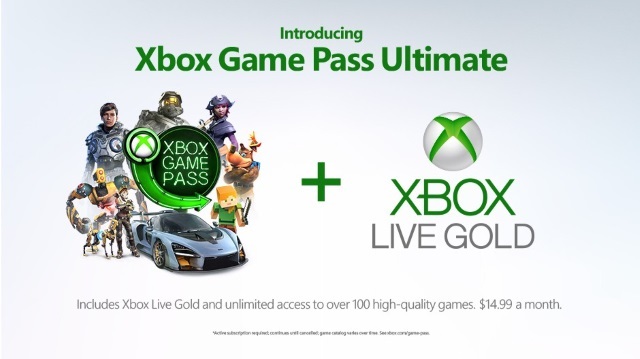 That means the full Xbox Game Pass library of over 100 high quality games, and Xbox Live Gold online multiplayer, in one convenient membership for $14.99 a month. With Xbox Game Pass Ultimate, gamers will be able to play together on the most-advanced multiplayer network and discover their next favorite game. Watch this space for details of when there is a wider launch.